measurement schematic 3 facet edge is sharper and gives more precise cutting. 2 facet edge profile is most durable and gives a good balance between sharpness and lifetime. Best quality 3 facet blade, single edge, aluminum back. Individually protected, 2 boxes of 100 each. Same as 121-1 above but in a handy plastic dispenser box of 100 blades. Push down on blue tab and a new blade pops up. Store used blades in rear slot for safe disposal. Top quality, single edge, 3 facet, GEM® carbon steel blades, aluminum back, 10 blades per dispenser, package of 12 dispensers. Used blades can be stored in bottom part of dispenser for safe disposal. Single edge, blued carbon steel, 3 faceted PAL® blade with aluminum back, individually protected. Box of 100. Durable 2 facet carbon steel blade. Single edge, steel back. Degreased and washed to remove oil and reduce particles on the blades. Packed in a clamshell of 115 blades with a protective foam layer; not individually wrapped; ready for use. For critical applications, cleaning with compressed gas is recommended. This single edge thin, extra long razor blade is made from uncoated carbon steel. The blade is 120mm long, 20mm wide and 0.12mm thick (4.72 x 0.78 x 0.005"). It is double beveled for increased strength and durability. Each blade is individually protected and lightly oiled for corrosion protection. Recommend cleaning with Isopropanol (Prod. No. 18242) before use. This razor blade is developed specifically for large brain matrices. 118mm long x 19mm wide x 0.229mm thick. (4.65 x 0.75 x 0.009"). Single edge carbon steel. Uncoated, 3 facet stainless steel, aluminum back, single edge. Individually protected. 2 boxes of 100 each. Same as 121-2 above but in a handy plastic pop-up dispenser box of 100 blades. Blades are degreased. Push down on blue tab and a new blade pops up. Store used blades in rear slot for safe disposal. Uncoated stainless steel, aluminum back, single edge blades in 10 blade safety dispensers, pack of 5 dispensers. The GEM® blades have a 3-facet edge with a steel back, and are degreased for clean room applications. Used blades can be stored in bottom part of dispenser for safe disposal. Blades are made from low carbon 400 series stainless steel. The hardness range of the blade is 56-63 Rockwell "C". Same 3 facet blade as 121-2 with aluminum back. Degreased and washed to remove oil and reduce particles on the blades. Packed in a clamshell of 115 blades with a protective foam layer. Not individually wrapped; ready for use. For critical applications, cleaning with compressed gas is recommended. Single edge, stainless steel, surgically sharp. Sturdy, long and effective cutting blade. Packaged 10 small boxes of 5 blades each in larger box. Personna® single edge, stainless steel, surgically sharp blade. Smooth, long and reliable blade. High quality, single edge, long stainless steel blades for extra cutting width. Individually protected, box of 250. Cuts through epoxies nicely. Stainless steel single edge, 3 facet, PTFE-coated stainless steel GEM® blades. Individually protected, 2 boxes of 100 each. Double edge stainless steel blades, degreased and individually wrapped. 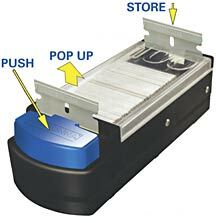 For vibratory microtomes such as the PELCO easiSlicer™, and Microslicer™. Suitable alternative to Feather® (#121-9) blades when used as is (unbroken) in the McIlwain Tissue Chopper. Protects your fingers while cutting and trimming with single edge razor blades. Accommodates all types of single edge razor blades we offer. The blade sits in a shallow groove and can slide side-ways. It is held in place by finger pressure. Maximum blade size is 60mm W x 20mm H (2.36" W x 0.75" H) and cutting opening is 20mm (0.75") wide.